Q: In a personal letter from Chairman of the State Affairs Commission of the DPRK Kim Jong Un to US President Trump, the possibility of holding the second DPRK-US summit was raised. What is your comment? A: We have seen relevant reports and noted that the US side said that it is open to have a second summit. We are glad to see these positive interactions between the DPRK and the US. It serves the common interests of all relevant parties, including the DPRK and the US, and meets the expectations of the international community to sustain the momentum of dialogue and detente and move forward peace talks. We hope that the DPRK and the US could earnestly implement the agreements reached at the two leaders' summit, strengthen dialogue and consultation, and work together to move forward the Peninsula denuclearization and political settlement along the right track and achieve new progress, and we will support their efforts in these aspects. Q: The London-based Financial Times quoted the Pakistani member of cabinet Abdul Razak Dawood as saying that Pakistan plans to rethink its role in the Belt and Road Initiative. The nine-member committee to evaluate CPEC projects established by the Pakistani side will think about stretching CPEC out over another five years or so. What is your comment? A: We noted relevant reports as well as the clarification this Pakistani official gave afterwards. On September 10, the Ministry of Commerce of Pakistan issued a statement, saying that what the Financial Times cited has been taken out of context and distorted and the Pakistani side rejects the article. 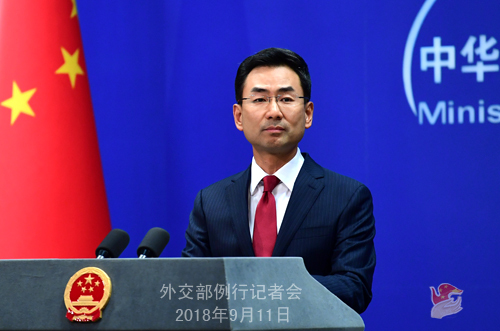 The statement also pointed out that during the recent visit of State Councilor and Foreign Minister Wang Yi, the Pakistani side made it very clear that CPEC is a national priority for its government. The Pakistan-China relations are impregnable and the government's commitment to CPEC is unwavering. As far as I know, the nine-member committee to evaluate CPEC projects was established to better coordinate with the Chinese side to accelerate CPEC building and deliver more benefits to the Pakistani people, rather than spread CPEC projects over a lengthier period. As is known to all, CPEC is a major economic cooperation project initiated to meet the needs of the Pakistani side, and its building has contributed to the social and economic development of Pakistan. There is a total of 22 cooperation projects under the framework of CPEC, of which 9 have been completed and 13 are under construction. The total investment amounts to $19 billion, raising Pakistan's economic growth by 1 to 2 percentage points per year and creating 70,000 jobs. These tangible outcomes are there for all to see. During State Councilor and Foreign Minister Wang Yi's visit to Pakistan, the President, Prime Minister and Foreign Minister of the new Pakistani administration all said that CPEC is a landmark project for economic cooperation between the two countries, which has delivered and will continue to bring tangible benefits to the Pakistani people. The new Pakistani government is committed to fully deepening the building of CPEC and is ready to make full efforts with China to ensure its sound development. China and Pakistan also reached new consensus on better advancing the building of CPEC during State Councilor Wang Yi's visit. The two sides agreed to determine CPEC's future course of development and cooperation through negotiations based on Pakistan's next-stage socio-economic development priorities and the needs of its people. We will focus on stepping up industrial cooperation and livelihood projects, gradually extend them to the western part of Pakistan and enable more Pakistanis to benefit from CPEC. The two sides also agreed that CPEC is open to a third party's participation, which will benefit the whole region. 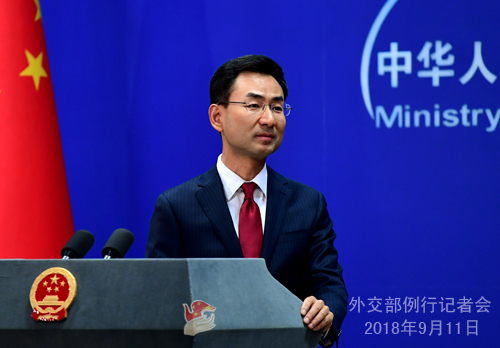 I would like to stress in the end that the Belt and Road Initiative is open, inclusive, and transparent, following the principle of discussing, building and benefiting together. Five years have passed since the BRI's inception. Now, it has become an important international cooperation platform and international public good to promote multilateralism and economic globalization. By far, over 130 countries and international organizations have signed cooperation documents on the BRI with China. If the BRI was born out of geopolitical motives and beset with risks and challenges, giving rise to crises and pitfalls, as some people alleged, then it could not have achieved the extensive popularity, fast progress and fruitful outcomes it is enjoying today. It all comes down to what we usually say: we welcome all like-minded countries to join the BRI so that altogether we could promote regional connectivity, development and prosperity and deliver more benefits to people around the world. Q: According to Taiwan media, a Japanese right-winger was seen kicking the memorial statue for "comfort women" in Tainan. What is your comment? A: As far as I know, this incident has caused public wrath and outrage in Taiwan. We all know that the forced recruitment of "comfort women" is a grave crime against humanity committed by the Japanese militarism in several victimized Asian countries during the WWII. It is a historical fact recognized by the international community. We hope that the Japanese side could face squarely the concerns of its Asian neighbors and the international community and deal with relevant issue in a responsible manner. Besides, I have some words for these Japanese right-wingers. We Chinese people say that he who knows no shame will end up bringing shame on himself. They should do some self-examination and have some self-respect. Q: UN Human Rights High Commissioner Michelle Bachelet said that the Chinese government's arbitrary detention of Muslims is worrying and China should allow UN monitors into Xinjiang. What is your comment? A: I talked about the situation in Xinjiang yesterday, so I will not repeat it here. I want to add that the UN Human Rights High Commissioner and her office should abide by the purposes and principles of the UN Charter, respect China's sovereignty, fairly and objectively fulfill its duties, and not listen to and believe one-sided information. Q: I want to seek clarifications on what you said about CPEC. Did you just say 19 billion dollars? Is that all the investment made in the project so far? Q: According to reports, the Philippines will send a delegation of over 100 members to attend the China-ASEAN Expo this year, the largest delegation the Philippines has ever sent for its participation in the Expo. Undersecretary Nora Terrado of the Department of Trade and Industry of the Philippines said that taking part in the China-ASEAN Expo is one of the government's strategic plans to open more areas of cooperation between the Philippines and China, and will contribute to elevating bilateral relations to new heights. What's your comment? A: The Chinese side highly appreciates the relevant remarks made by this official of the Philippines' Department of Trade and Industry. Since the turn-around of the China-Philippines relationship, our two countries have seen frequent high-level exchanges and flourishing cooperation across the board, especially remarkable economic and trade cooperation, which have delivered tangible interests to the two peoples, the Philippine people in particular. The Philippines is an important member of ASEAN. 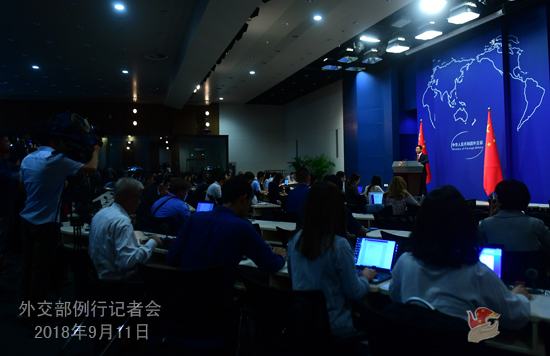 China welcomes the Philippines' decision to send a large delegation to the China-ASEAN Expo. We stand ready to work with the Philippine side to boost bilateral trade and investment cooperation and seek more substantive outcomes from China-ASEAN cooperation.